What does it mean to be a Female Superhero? What does it mean to be a Female Superhero, in an Arab country? What does it mean to be a Female Superhero, in America? What does it mean to be a Female Superhero, all around the world? To find out more, read her blog, and check out the web comic. This September, her webcomic, “Qahera,” won the award for best digital comic series at the Cairo Comix Festival. Congratulations! It’s a fantastic small press/zine/comic convention in Cleveland, that I’ve been attending and participating in, for over 5 years. 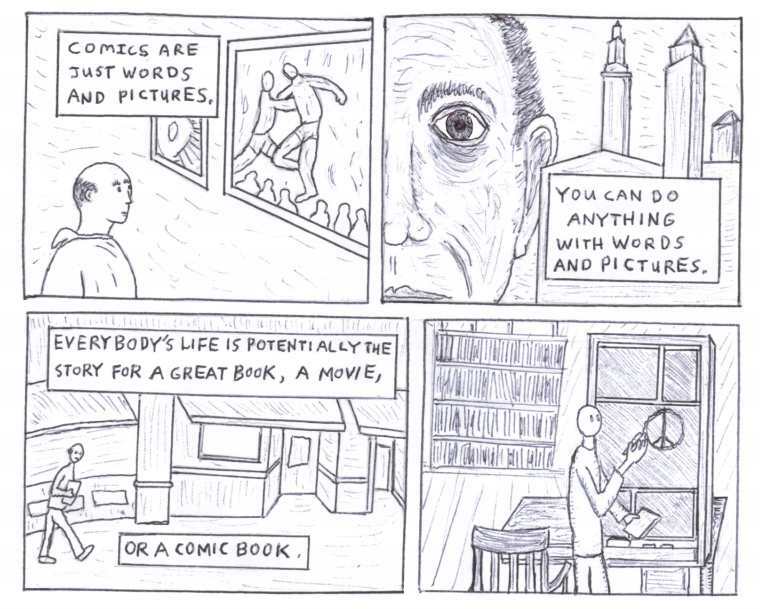 This comic refers to a permanent art installation/sculpture that I saw, at the Lee road library, in Cleveland Heights. The sculpture includes a chalkboard where one can draw their own comics in chalk. My comic refers directly to the comic molded on the other side of the chalkboard. The sculpture was created to memorialize the Cleveland comic book artist, Harvey Pekar. These pages are from my new comic called Visceral Story. Be sure to click the link and read the comic!